Read the latest Sitrep #00114 from Bohemia Interactive, particularly the 'Intelligence' section. Obviously well done to our modding team for the quality of work produced which is even catching the attention of the game developers, and to our media guru's for spreading the word on Youtube, Twitter (nice one Deejay!) and elsewhere, but also to all 3CB members for making this a thriving community that continues to go from strength to strength. 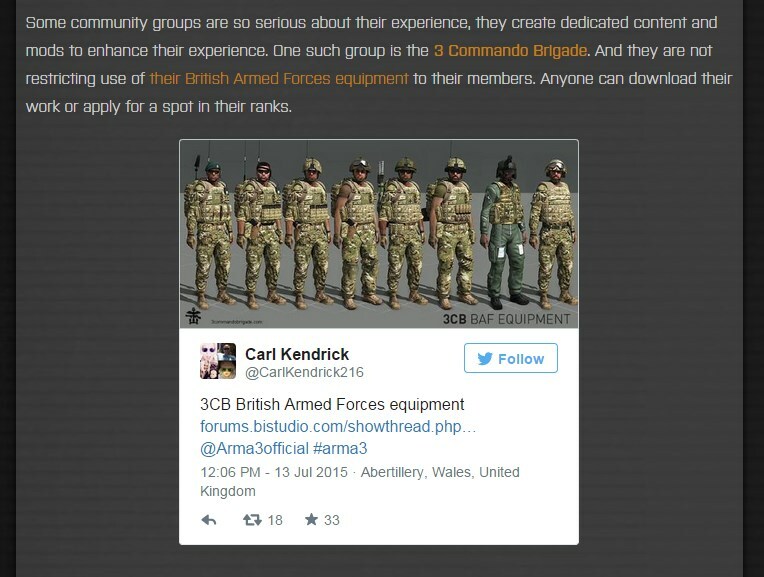 Thank-you BIS for including 3CB in your Sitrep and for continuing to develop this awesome game! Utterly epic! and paints us rather nicely to boot! Monitor: Many pixels, such wow. CPU: There's definitely one in there. Graphics card: That or a pink wafer biscuit. SSD: Ooh I know this one. Sorry guys, I meant to lock the topic as it's a News Item.